In the decade since Fred Wiersema coauthored the #1 bestseller The Discipline of Market Leaders, a momentous shift has occured. We have entered an age of customer scarcity--an age in which exciting, often unorthodox companies are revolutionizing the global marketplace. In this path-cutting work, Wiersema provides new benchmarks for ranking businesses in this new economy and reveals the strategies that set winning companies apart. After tracking 5,000 companies worldwide for over six years, Wiersema discovered that just a few hundred of these of these exert tremendous influence on the new economy. Here, he explains why traditional measures of competitive prowess no longer apply and, using new yardsticks, identifies today's 100 most influential businesses. With practical strategies for managers and investors, Wiersema then shows how to recognize and emulate these dynamic new market leaders. The idea for this book originated during a World Economic Forum summit meeting in 1996. Over lunch, I joined a number of U.S. and European executives in aan animated discussion about the emerging Internet economy. In the United States, some of the Europeans noted, managers appear fascinated by colorful stories about upstarts, whereas in Europe they show a bias for hard data and solid track records. "Tell me," one person asked, "when you watch all the hype about the the Web and these New Economy players, how do you size up their true influence and potential?" With no satisfactory answer, it occurred to me that we needed a fresh way to look at companies' performance and market strategies, and one that would apply to both conventional and new businesses. Consider: When Fortune magazine surveyed more than ten ten thousand executives, directors, and securities analysts to compile its 1999 lists of most-admired companies, Catepillar Inc. led the industrial and farm equipment suppliers, and Merrill Lynch &amp; Co., the securities firm. The question is, did Fortune's list really identify the role models for the New economy? Did it pick out those companies that strongly influence how the marketplace is evolving in this era of unprecedented competition? These questions questions assume critical importance as managers try to cope with today's challenges. 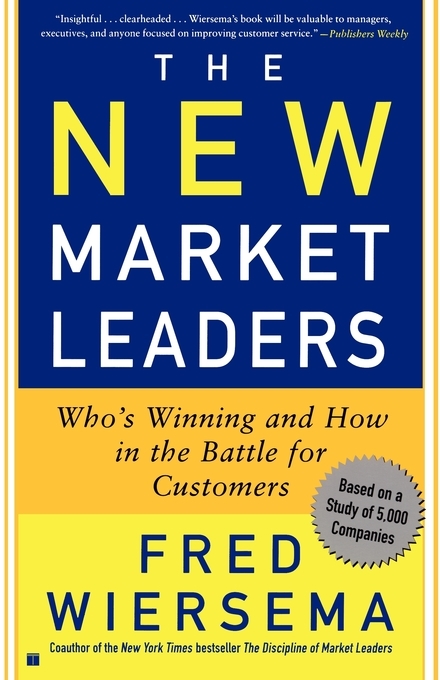 When I designed my own list of the top 100 new market leaders that same year, Caterpillar and Merrill Lynch were not on it. And that was only the beginning of where the lists differed. My lists included then ( as it still does) Yahoo! Inc., QUALCOMM Inc., Amazon.com, Inc., Amegen Inc., Solectron Corporation, Infinity Broadcasting Corporation, and Carnival Corporation. Theses highfliers and others whose names you recognize instantly--because their appeal to customers and performances in the stock market over the past several years have been nothing short of phenomenal--were not even mentioned on Fortune's 1999roll of honor. A year later, Fortune still had not recognized them.